The VB6 Cookbook is a companion to New York Times columnist Mark Bittman's ever popular VB6 diet, a plan that helps you live better, lose wight and get healthy by eating strictly vegan meals before 6pm and enjoying a wide array of foods for dinner. The cookbook has over 350 tasty, easy to make recipes beautifully photographed and easily adaptable. The VB6 Cookbook showcases a reliably simple and straightforward way of cooking. Most of the recipes include variations and countless ideas for tweaking them to your taste, highlighting how simple it is to avoid the repetition and boredom that comes with most other meal plans. I love that there are not only recipes but actually a month's worth of meal plans, tips on stocking your pantry and practical building blocks for changing and sustaining a lifetime of healthy and pleasurable eating. The VB6 cookbook gives readers the tools and the motivation to cook, eat and live healthier. The recipes under the heading breakfast intrigued me the most. I'm not a big fan of breakfast foods and I liked the idea that most of the recipes are for very non traditional items and are so easily adaptable. I used the Bulgar Pilaf recipe base to create my Apple Pie Bulgar. 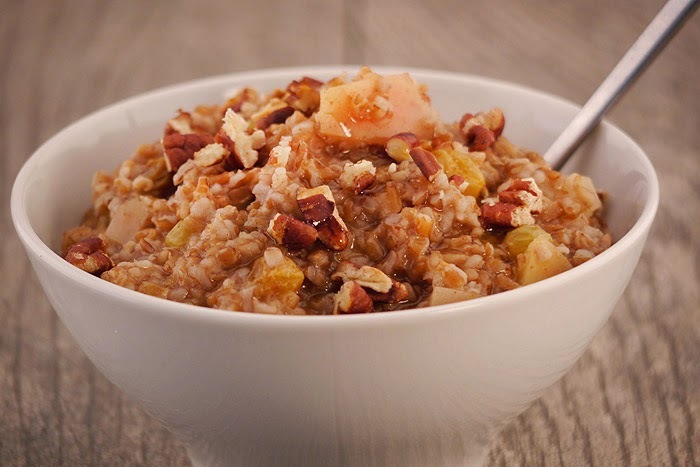 Warm apples, cinnamon, nutmeg and raisins mixed with bulgar and topped with toasted pecans is like having a big slice of apple pie for breakfast. This recipe was fairly simple to put together and tastes even better eaten the next day, so be sure to make extra because you're going to want it! 1. Set a large, deep skillet or medium saucepan over medium-high heat. Add the oil to the pan and when it's hot, add the bulgur, cinnamon, and nutmeg. Cook, stirring constantly until fragrant, less than 1 minute. Add the raisins, salt, water, and chopped apple, bring to a boil. Reduce the heat to a gentle bubble and cover the pan. 2. Cook, undisturbed, until most of the liquid is absorbed and the bulgur is just tender, 5 to 10 minutes. Uncover, and add a little more water if the grain is sticking to the bottom. Replace the lid, and remove from the heat. Let the pilaf rest for at least 5 minutes or up to 20 minutes. Taste, add the pecans and more salt if necessary, fluff with a fork, and serve hot or warm. I'm not sure I could ever really be vegan (bacon is my best friend, for reals) but I could always get on board with this breakfast. It looks amazing! This is an awesome breakfast idea! Sounds like a really hearty breakfast! I've never heard of that diet before. I love to learn new things from other bloggers. Thanks for introducing me to it. Love how easy this looks to put together...and that it's even better the next day!!! Yum! It looks so delicious!! I have noted this recipe which would try on my friends get together this weekend. Thanks for sharing this yummy recipe. The flavors and textures you have going on in this looks amazing! I'll have to give it a try. I often use bulgur as a savoury grain, but somehow it never occurred to me to use it as the base for a hot morning cereal... I can just imagine how hearty and delicious it is with the apple pie topping you've used here, though! Pinning this for when the local apples are in season. I really need to add more bulgur to our menus! I have never tried bulger before! I am definitely trying this! Thanks for sharing. Pinned! Visiting from The Kitcheneer because I'm always looking for new healthy recipes.